Intex Technologies, one of the major consumer durable brands, today announced the launch of its two new channel speakers XH Bomb SUFB (2.1 and 4.1). 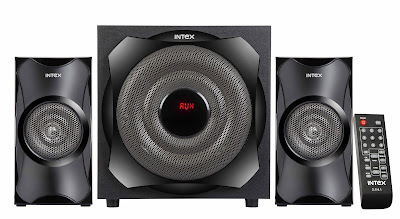 With this launch, Intex now has 29 models in 2.1 series and has 16 models in 4.1 series, whereas it already has 11 models in 5.1 series, taking the total speaker portfolio to 70+ models. These new speakers have interesting designs and features that make them stand out from other speakers currently available in the market. Along with this they have excellent sound quality with an effective strong base and punch. Connectivity : The new range of 4.1 and 2.1 channel speakers boast of AUX audio input compatible with DVD/PC/TV; fully functioned remote control; digital FM playability and digital controls like mode, play/pause etc. The speakers also have an attractive LED screen display. The speaker models come with 4.1 and 2.1 channel M/m speaker with SD/USB/FM/BT/AUX. The AUX is compatible with DVD/PC/TV also, it comes with the fully functional remote control. Both the speakers have LED display and Digital FM playability. These speakers will be available through the company’s vast distribution network across India.